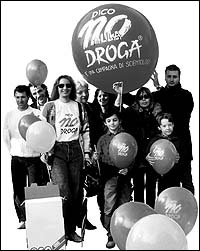 The Say No to Drugs, Say Yes to Life campaign is popular throughout Italy as an effective educational movement promoting drug-free communities. ow often have you told your child not to play with matches, talk to strangers or stay out late after dark? If your child is like most, you fear such warnings will go unheeded. Scientologists believe that the real answer to keeping children off drugs is not for parents to force a view onto their children, but to provide a child with a full understanding of the dangers of drugs so that he makes his own selfdetermined decision to be drug-free. That is entirely the thrust of the Drug-Free Marshals program sponsored by the Church of Scientology. What happens then if you try to educate a child about the dangers of drug use, especially in a world where children as young as 12 buy and sell crack cocaine and other street drugs to their friends? As long as your son or daughter is under your watchful eye, the problem is not as threatening. But what happens when you are not around?